Because of my frequent trips to the local farmers’ market this summer, I have been making bokkeum dishes quite often. 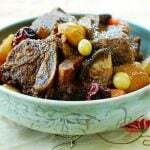 Bokkeum refers to Korean dishes that are stir-fried or sauteed in a sauce. 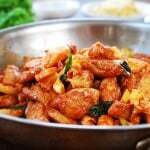 Variations of main dishes and side dishes prepared in bokkeum style are infinite. 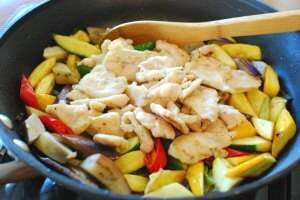 Here, the ginger marinated chicken (dak) pieces and summer fresh vegetables (yachae) are simply stir-fried in a little bit of oil infused with aromatics. The sauce is light yet rich in flavor. This dish is so versatile that you can practically use any meat, seafood or vegetable of your liking. Adjust cooking time depending on the ingredients. 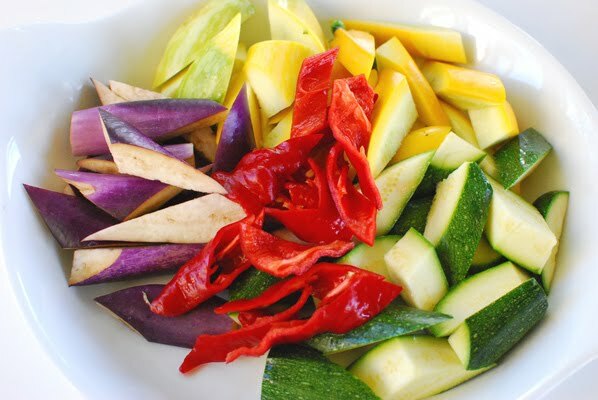 Remember to add the vegetables that need more cooking time first. 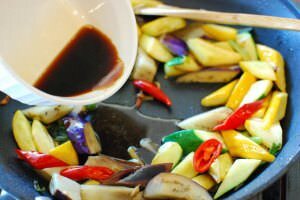 The actual stir-frying process goes very quickly, so prepare all of the ingredients and sauce before you begin cooking. The result will be a perfectly satisfying one-dish meal. 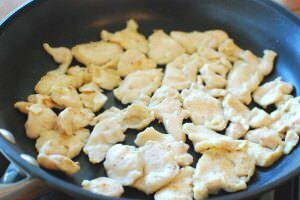 Cut the chicken into thin bite size pieces against the grain (about 1/4-inch thick). 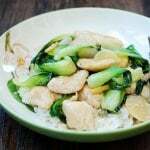 Season with salt and pepper and mix with the grated ginger, rice wine, and corn starch. Let it marinate while preparing vegetables. 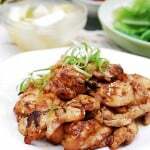 Combine the sauce ingredients, except the sesame seeds and sesame oil, and set aside. 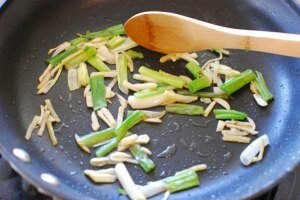 Heat a large non-stick skillet or wok over medium high heat. Add a tablespoon of the canola or vegetable oil. 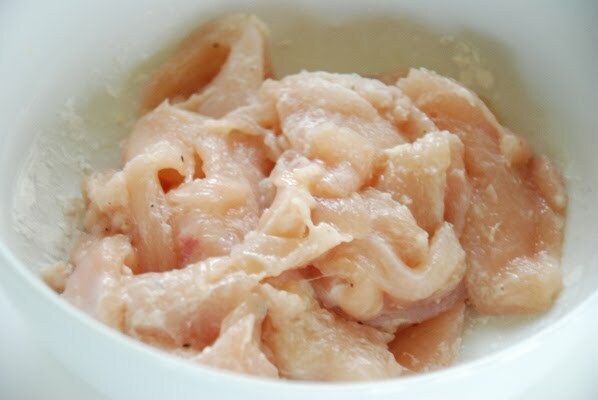 Add the chicken pieces in one layer and cook until they are longer pink, about 2 minutes. (The chicken does not need to be cooked through at this point.) Transfer to a plate. 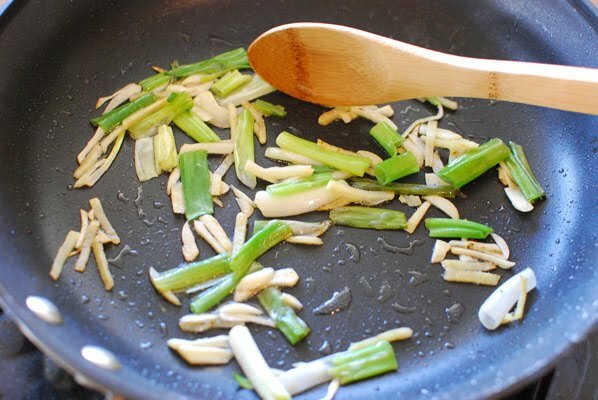 Reheat the skillet or wok over medium high heat. Add a tablespoon of the oil. Stir in the aromatics and cook just enough to infuse the oil with flavor (about 10 seconds). Add the vegetables and stir-fry until softened but still crisp. Push the vegetables to the sides of the skillet and stir in the sauce in the middle. Turn the heat up high. Return the chicken to the skillet. Stir-fry everything together for one or two minutes until the chicken is cooked through and the sauce is well incorporated. Add the sesame oil and seeds at the end. Serve hot with a bowl of rice. 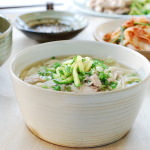 I love the ease and versatility of this recipe though I can’t really pronounce the name LOL The fact that Korean cooking is almost never short on garlic, chilli and ginger is one of the major reasons I am so crazy about it – life would be difficult without these flavours, I think…. 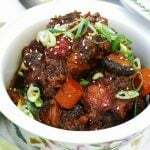 agreed, this dish is delicious, I use a different version with Korean chile sauce and fewer vegetables, I think its pretty flexible and with that ginger, garlic, onion, chile base its hard to go wrong! Beautiful dish! And I love all the vegetables you used. Thanks for sharing. I love the adaptability of the recipe. Using what is fresh and seasonal is key! Thanks for sharing. Wow…that looks amazing, so colorful must be delicious. You have lovely recipes here. Have a great Sunday. Loads of fresh vegetables and beautiful colours. Denise, Casey, Lisa, Joyti, Anna,and Jeroxie – Thank you for stopping by and leaving such encouraging words. It’s always my pleasure to see you all here! this stir-fried chicken and vegetable looks so so so yummy. I love it. Thank you very much for sharing this awesome recipe. I wish you all the best. Hi Hyosun, I love your simple stir-fry. It looks fresh and yummy. 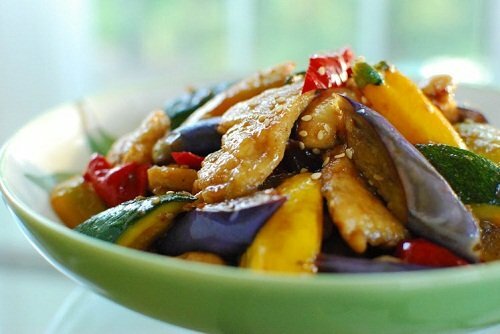 I love eggplant but rarely add this to my stir-fry. I’ll have to try that next time! 🙂 BTW, your photos look great! I was looking for a recipe that I can incorporate a lot of fresh veggies and I stumbled upon this one. This recipe was delicious! I used sambal oelek instead of crushed red pepper, and red bell pepper instead of red chili pepper. As I eat leftovers while writing this, I’m wishing I had made more 🙂 This one is a keeper in my dinner rotation. 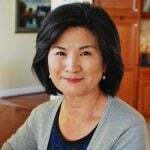 Can’t wait to try other recipes on this site.